Majority Leader, Ahmed Nihan Hussain Manik speaking at the Parliament. 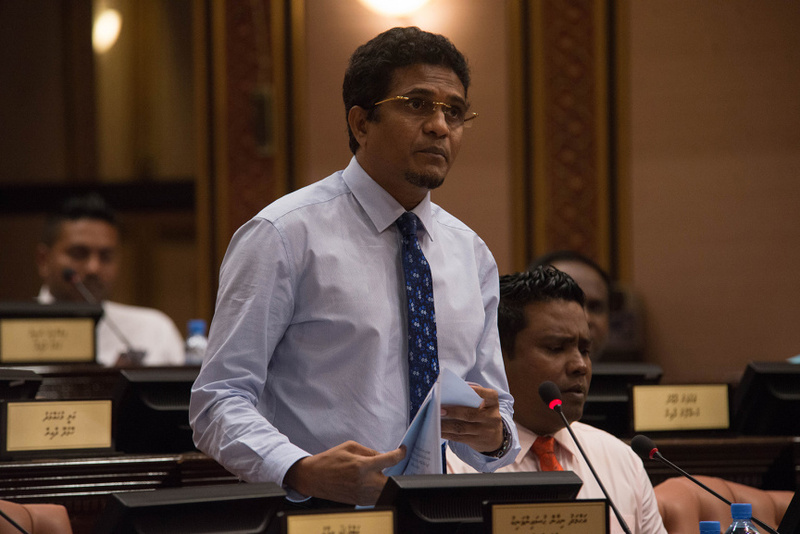 The Leader of the PPM Parliamentary Group, MP Ahmed Nihan Hussain Manik has said that the law needs to be amended so that Maldivians in self-exile in other countries cannot run in Presidential Elections in the Maldives. Nihan, the MP for Vilimale' constituency, made the remarks at the Parliament sitting today while presenting the amendment to the Law of Elections to obligate those who take up residency in the Maldivian citizen to wait ten years before they can run in a Presidential Election. He said that the amendment was brought forth for a very important reason and that is there are some who has expressed interest in quickly becoming the President of the Maldives right after coming to the country after a long time abroad and they cannot even properly speak in Dhivehi. Nihan said that this should only include self-exiles who move abroad and then return for a Presidency but those who migrate abroad, defame the country and hold multiple passports from different countries. MP Nihan said that this might be difficult for some Maldivians to hear but "people like that would be fine with us (Maldivians) being in occupied by another country. We cannot accept that." Speaking at the Parliament sitting where none of the opposition MPs took part in, other MPs of PPM supported Nihan's remarks. And so the MP for Gemanafushi constituency, Jameel Usman, proposed an amendment that states those who return to the country from foreign asylum status needs to wait ten years before they can run in a Presidential Election. MP Usman said that it would take time learn a person's perspective on the state of the country, his faith and thoughts on the national inheritance.